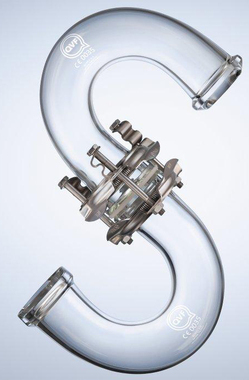 In addition to reactors, DDPS offers a range of piping in glass-lined steel or solid borosilicate glass construction, giving the optimum properties of mechanical resistance and an excellent resistance to corrosion. Select from straight pipes, elbows, reducers, tees, crosses, flanges, and other components to create pipeline that customized to fit your process. To control corrosion, preserve product purity and ensure easy cleaning and smooth flow, De Dietrich glass-lined pipe and fittings provide a "full circle" of protection. The superior De Dietrich acid/alkali resistant glass coating is suitable for most process materials. De Dietrich glass-lined pipe and fittings are made with the same care and workmanship used on all our equipment. All pipe and fittings are made from low carbon seamless steel pipe with forged-steel stub ends. Blind flanges and spacers are also of steel construction. All pipe is made to order. 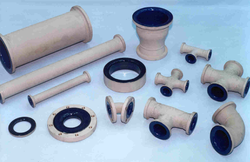 De Dietrich glass-lined pipes are supplied with loose split flanges. The glass lining covers the inner wall and stub end faces. Diameters from 1 1/2" to 8"
The QVF SUPRA-Line component system reflects the continued evolution of our borosilicate glass range of products. This latest development results in a complete system of borosilicate glass products that are compatible with both the former KF and WPR systems. Better visibility of processes inside the system. Compatibility with existing systems, which allows additions onto systems already in use. Increased Safety – including higher pressure/temperature ratings and engineered flanges and connections. Improved Design – including new patent pending spring elements, a simplified grounding method, cleaner valve designs, and much more.